(Nanowerk News) Sometimes, molecules need help making the right connections. When multiple ways exist to join organic fragments together, metal catalysts can direct the assembly process so that only certain structures form. Now, Shunpei Ishikawa and Kei Manabe from the RIKEN Advanced Science Institute in Wako and the University of Shizuoka, Japan, have developed a palladium-catalyzed procedure that couples aromatic rings in completely unexpected ways, thanks to a new molecular ligand with specially designed spatial attributes ("DHTP Ligands for the Highly Ortho-Selective, Palladium-Catalyzed Cross-Coupling of Dihaloarenes with Grignard Reagents: A Conformational Approach for Catalyst Improvement"). Ishikawa and Manabe studied how to attach a benzene-based molecule to another aromatic ring containing an alcohol (–OH) group and two bromine (Br) atoms, located either beside (ortho) or far across from the –OH. Reactions that can link the rings at one of the Br sites, while leaving the other untouched, are extremely valuable to synthetic chemists for creating drug compounds and materials like liquid crystals. Because the ortho-Br is the geometrically and electronically least favored addition site, it is particularly difficult to establish couplings there. Figure 1: A new molecular ligand, called DHTP, helps selectively generate ortho-coupled aromatic rings (left) instead of the usual coupled product (right). 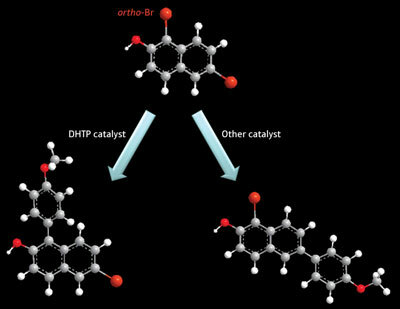 The researchers designed a new series of molecular ligands, called dihydroxy-terphenylphosphines (DHTP), to enable ortho-selective aromatic couplings. DHTP consists of three benzene rings, linked end-to-end through rotationally flexible carbon–carbon (C–C) bonds; the first benzene contains a phosphorus group, while the third has dual –OH units. According to Manabe, DHTP ligands had the right geometric balance needed for this reaction. The researchers attached the DHTP ligand to the bromine-containing aromatic ring via a magnesium atom that bridges the molecules together through their respective –OH functionalities. Then, they added a palladium catalyst to the reaction, which they assumed would bind to DHTP through the phosphorus unit. In this geometric configuration, the palladium atom can only interact efficiently with the ortho-Br atom to initiate a catalytic cycle that yields ortho-coupled aromatic rings with 80–90% selectivity and few by-products (Fig. 1)—a complete reversal of the usual aromatic coupling. The DHTP-based catalytic system improved upon the authors’ previous work ("ChemInform Abstract: Oligoarene Strategy for Catalyst Development. Hydroxylated Oligoarene-Type Phosphines for Palladium-Catalyzed Cross Coupling.") by having two –OH groups on the ligand, instead of one; this way, there is always a magnesium atom located close to the palladium catalyst, even if a C–C bond rotation occurs. “For me, it is very interesting that introducing only one –OH group improves selectivity and reactivity to a great extent,” says Manabe.